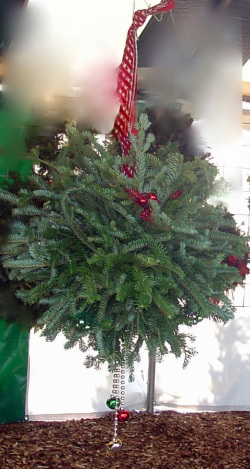 Balsam, Fraser, and mixed wreaths, kissing balls, cemetery wreaths, large & small decorated items, garland, center pieces, and seasonal arrangements made daily. Special orders gladly taken! DragonFly Soap & Spa items, Bentz Road Farm Soy candles, Victorian Hat Pins & Holders, local artisan crafted jewelry, ornaments, aprons, gourd bird houses, wedding cake toppers, and more available for purchase in our gift shop. Treats and snacks... just in case! Fresh hot popcorn, hot chocolate, water, soda, juice, snacks. On weekends bring yourself and your family don't worry about bringing saws or how to tie your tree. We have free tree tying & loading. During the week we still supply saws and twine but we are moving to self service loading from noon until 4:30 PM. Of course, Well behaved-leashed pets always welcome! Check out our Odds and Ends there are sure to be treasures at an unbelievable price!